I feel I should mention that, despite the sadness expressed at leaving Australia, I have, since my first trip Down Under, created a fulfilling life focused on things I love: writing, sharing, history, food, culture, travel. I’ve been to dozens of other places (see my The World’s Fare blog for some non-Aussie travel tales), and I’ve had an additional two trips to Australia (which I’ll be sharing here). I had some amazing experiences on those trips. While I’ve written books (including, of course, Waltzing Australia) and hundreds of magazine articles, a large part of my writing has been in the realm of education: history, geography, and language arts. I’ve worked for every major educational publisher in the U.S., including the Colonial Williamsburg Foundation and National Geographic Learning. Sharing what I’ve learned in my travels and research is always a joy. I’ve even gotten to write student readers on topics related to Australia (one on the Great Barrier Reef, one on the platypus, and a couple on Captain James Cook). For the last 20 years or so, in addition to education, I’ve been working in the arena of food history. Much of my travel has focused on place where food history is anchored: Mexico, South America, China, India, the Spice Route, and so on. More recently, I’ve been focusing on history closer to home. The combination of food history and home focus has resulted in my newest book, Midwest Maize: How Corn Shaped the U.S. Heartland. If you look at the list of links at right, you’ll see I’ve also started a blog to support that endeavor. So it did hurt to leave Australia, but I’ve found that joy can be found anywhere. It is not a place; it is a mindset and a journey and a feeling that one is contributing. Still, I will never stop loving Australia, and I delight in sharing its beauty, wonder, and friendliness with others–something I do not only through this blog but also through slide shows and speaking engagements. Australia is the anchor of my current life. It will always be part of me. And there is still vastly more I want to share about it. So please do keep coming back. Time to go. I depart Australia this time with a different sadness but the same refrain: “Next time. Next time.” I am rejoicing at the beauty, the privilege of this return trip. Still, I am in pain. Leaving is made easier, however, by the belief that, since I made it back once, I’ll make it back again. The future must hold another visit to Australia. Thanks to the International Dateline, after more than 9 hours in flight, I landed in Hawaii a few hours earlier than I left Sydney. Almost like time travel. I was greeted by a lovely, steamy dawn in Honolulu. Customs at this hour was nearly empty and we passed through easily. Having left, my mind speeds homeward ahead of me. Fortunately, I have a life worth returning to–a life I created after my first trip to Australia. I begin to focus on that, with thoughts of what the future holds, both at home and on the road. Still, it will take time to shake off Australia–but then I don’t have to, really, not completely anyway. I can simply start planning the next trip. It won’t take so long next time. Last day in Australia. I was up at dawn and walked across town, photographing everything in an effort to somehow hang onto it. Then I headed to Circular Quay, to the spot where all the day-tour buses gather, for my visit to the Blue Mountains. The area was crowded and the buses were filling rapidly, which was to be expected, but it made me wonder whether this was going to make any quiet communing with nature possible. Still, I was headed for the mountains, so I was happy. One bus filled, and I was among the first on the follow-up bus, which meant I got a great seat—window near the front. This made the drive out of the city and up into the mountains a delight. I’ve posted so often about these mountains (Sept. 20, 2010, Oct. 23, 2011, Nov. 21, 2011, and Nov. 30, 2011) that I’ll spare you the rhapsodizing and detailed descriptions here, but suffice it to say I was enjoying the fragrant crowds of eucalyptus trees and sheer cliffs of the range. The mandatory stop at a wildlife sanctuary offered joy in the form of wombats, wallabies, kangaroos, brolgas, cockatoos, penguins, and other Aussie classics. I never tire of these creatures, so I was pleased to have them filling my eyes again. Then it was off to Katoomba, to stop at the spot I’d visited previously, perhaps to hike, definitely to see the Three Sisters rock formation. It had begun to drizzle lightly, but the scenery was still wonderful. Sadly, however, things at Katoomba had become more touristy. The little restaurant and shop at the site had been built up considerably, and one wing was packed with video games, and all the machines were in use. I was pretty stunned that people would come to a place of stunning beauty like this and stay indoors playing video games, but clearly nature wasn’t the draw for them that it was for me. I wandered outside, hood up against the light mist, and strolled the short distance to the edge of the cliff. As I had seen on my previous visit, there were numerous parrots gathered nearby, especially king parrots and crimson rosellas, lured by a few well-stocked feeders. I was happy to note that, with everyone packed into the restaurant or occupied with the video games, communing with nature was actually pretty easy. 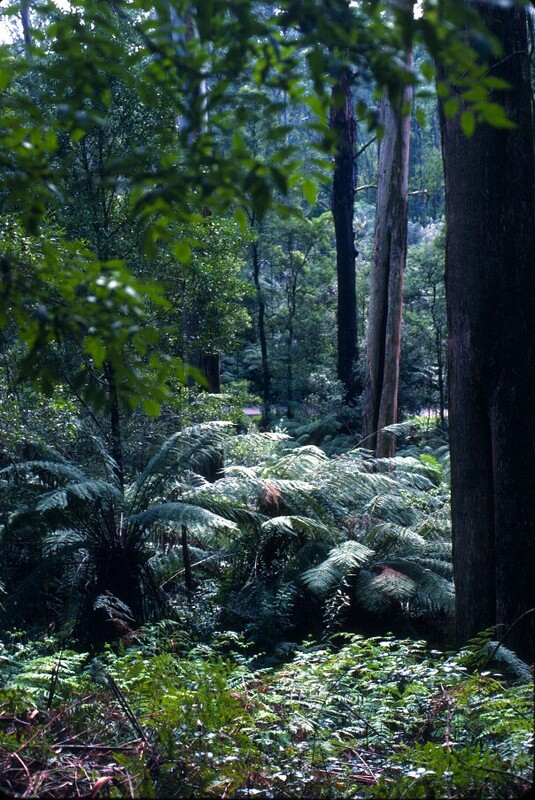 We’d been released for a couple of hours, so I began to hike through the damp foliage. It was quiet and peaceful and exactly what I needed. 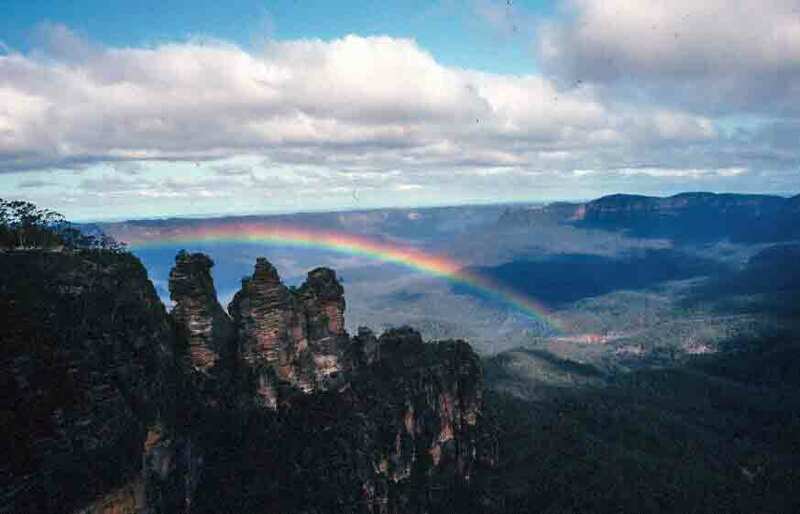 When I finally made my way over to the Three Sisters rock formation, there were breaks in the clouds, and I was treated to the remarkable sight of a rainbow arching over the three rock pinnacles. I was delighted beyond words. It seemed the perfect climax to the trip—a moment of quiet serenity and remarkable beauty. Tonight, I’ll pack. Tomorrow, I’ll leave. But at this moment, I could simply relish this perfect cap to a wonderful trip. I felt grateful and blessed. Spent the day in downtown Sydney, shopping and walking. I wandered through the flashy Darling Harbour area–lots of shops, restaurants, hotels, and things to do. I mostly just admired the bright openness of the place, but did stop at a shop that sells Akubras (makers of the hat I’m wearing in my picture on the cover of my book) to buy a small flourish of feathers for the hat band, the original ones having gotten torn out by a branch during my riding trip in the Victorian alps. I then headed for the Queen Victoria Building. The QVB is a gorgeous old edifice, with statues, mahogany banisters, sweeping stairways, stained glass windows, vaulting arches and general magnificence on all hands. Constructed in 1898, it has lived many lives but has now been restored to its original intention of housing artisans, shops, showrooms, trades people, and cafés. Shopped along George Street and then over to Pitt Street and down to Circular Quay, passing through Macquarie Place and over to the Rocks. I wandered happily among the old buildings but found the area enough changed to wonder if places I’d been before would still be there. A few were, but much of it was new. (Historic buildings were still there, but many had new tenants.) I had hoped to find again the golden wattle perfume I had purchased previously, but while the shop was still there, it was going out of business, and they no longer had the scent I loved. Still, the old buildings and old streets of this oldest part of Sydney delighted me, even though some that was familiar had vanished. As much as I was enjoying the Rocks, on the whole, I was not enjoying being in the city. I had spent too much time surrounded by natural beauty, and I began to feel like two days was too much time here. Even the concrete was disagreeing with me. Despite having walked or hiked for hours every day while in desert or forest, I was getting blisters from walking on sidewalks. So I turned my steps back into city center to find the NSW tourist office, where I booked a day tour out to the Blue Mountains for tomorrow–one final dose of the bush before I head for home! Then I figured I’d better tackle the last of my shopping endeavors, so headed to the handsome Strand Arcade, where I found the remaining gifts needed for folks back home. Finally, after many hours of wandering, I headed back toward Chinatown and the Cambodian place I had discovered last night. Not sure when I’ll ever get Cambodian food again, so don’t want to miss another opportunity. Good day. And tomorrow, back to the Blue Mountains. This morning, Judy and I headed for Australflora and Gum Nut Village, a nursery that specialized in Australian plants, plus craft gallery and tearoom, all run by a charming, lucid man named Bill, who obviously knows Judy well. (Not too surprising, given how focused on indigenous plants Judy’s garden is.) We browsed for a few hours through the fabulous flowers, and I bought a few packets of seeds, to see if I can raise a few Aussie blooms in a pot back home. We chatted with Bill for a while, about local events, local folks, and how to care for a few plants Judy recently obtained. Then we headed for the giant “gum nut.” A gum nut is the hard, woody fruit of a eucalyptus tree—though in this case, it is a replica of said fruit the size of a small cabin. This gum nut houses the craft gallery as well as a lot of May Gibbs books and paintings. May Gibbs was the artist/writer who, about 100 years ago, created a world of fairy folk that she dubbed gumnut babies. 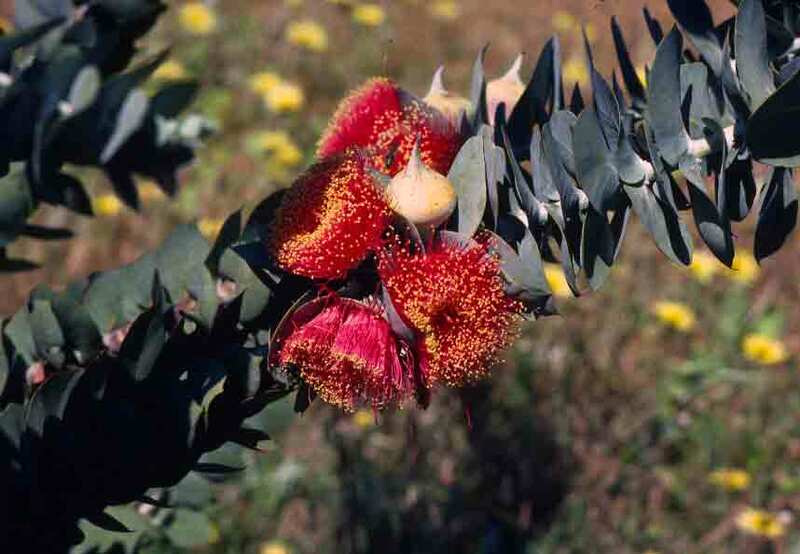 These delightful little creatures, who lived among and dressed in the flowers of gum trees (eucalypts), populated a series of children’s books, the most famous being Snugglepot and Cuddlepie, which appeared in 1918. Gibbs’s creations became part of Australians’ childhood heritage. In fact, so iconic was Gibbs’s work that she was honored with a Google doodle on her 136th birthday. And in case you haven’t seen a gum flower before, here is one of the many varieties—and one can see how easy it was to imagine it as the attire of tiny fairies. Judy and I had lunch in the tearoom then we headed back to the house. Geoff was waiting for us. We chatted for a little while over tea, then I finished packing. At 3:00 pm, it was time to head for the airport. Judy and Geoff have been so gracious and generous, as well as a lot of fun, that I really hated saying good-bye. However, I’m sure part of that is also realizing that the trip is nearing its end—too soon, I’ll be saying good-bye again to Australia. It was dark by the time I landed in Sydney at 6:15. I caught the bus to the city then hiked the rest of the way. Fortunately, I have a suitcase that can convert to a backpack, and when the walk turned out to be longer than I’d anticipated, I made that switch. Still, even with the suitcase worn as a backpack, I was fairly weary as I climbed the stairs to reception at Sydney’s Traveller’s Rest Hotel. However, I was pleased to find that, though a bargain accommodation, Traveller’s Rest was clean and cheerful and quite comfortable. After settling in, I walked toward nearby Chinatown, stopping at a place that offered an all-you-can-eat Cambodian buffet. Glass noodles with tree ears, curried eggplant and pumpkin, meat with chilies, tofu with veggies, and several other dishes made for an interesting and tasty meal. Then it was back to the hotel and early to bed. Tomorrow, I get to find out how Sydney has changed. Beautiful day. Weather was cool but brilliant. We walked to the Pony Club for a horse show and barbecue lunch. Here, I met all the people Judy has talked about all week: Joe, Anthony, Brendon, Agnes, and many others. Anthony is a horse trainer who has been working with Judy’s Rahmyl, so I’ve heard the most about him. All were delightful people, warm and welcoming. Easy to see why Judy likes them all so well. Ferns at the ranch’s edge. We got back to the house by about 3:00 o’clock. The weather had warmed up, so we made tea and sat on the deck, watching the horses and the hundreds of birds that live and/or feed here. 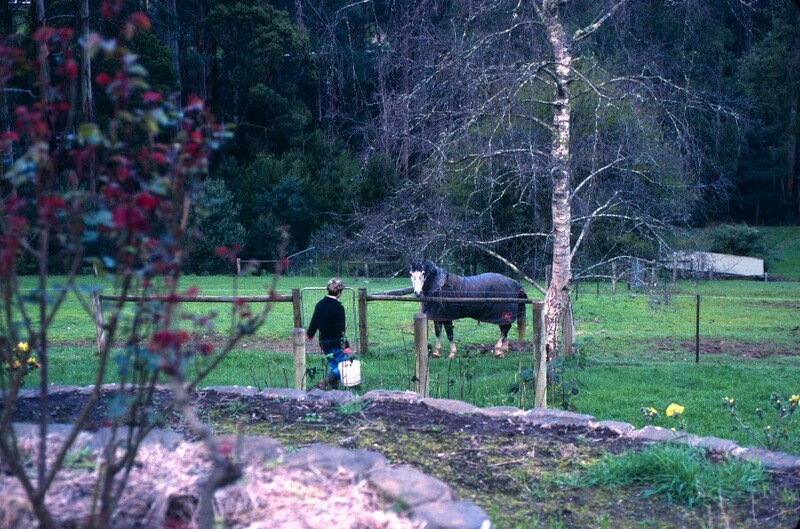 Geoff did a few chores while Judy and I relaxed, then Judy fed the horses. I took photos and watched birds. Judy made a splendid roast lamb dinner for our last evening together. Then we spent the evening watching a video of the Shazada, the world’s longest endurance race, which is held in New South Wales. As an endurance rider herself, Judy was very knowledgeable about the event, horses, and riders, so I learned even more than the video offered. We chatted about world events, life, horses, and Australia, in no hurry to end the lovely day and evening. But we did finally trundle off to bed at eleven.